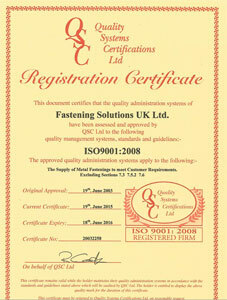 Fastening Solutions UK Latest News Articles & Updates. Our entire range of threaded brass inserts products has full batch traceability. 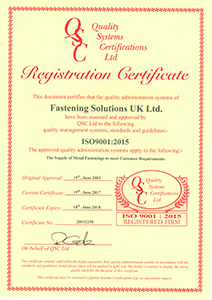 Fastening Solutions UK are pleased to announce that they are one of the first companies to gain approval to the new ISO 9001:2015 Quality Standard – follow the link to the new certificate. 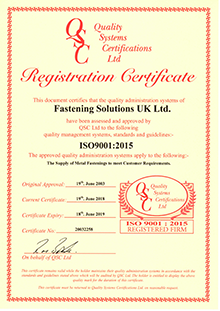 Fastening Solutions, leading supplier of threaded brass inserts for plastics and captive fasteners, are pleased to announce that they have been ISO 9001 certified again this year. Download the ISO 9001 PDF certificate here. 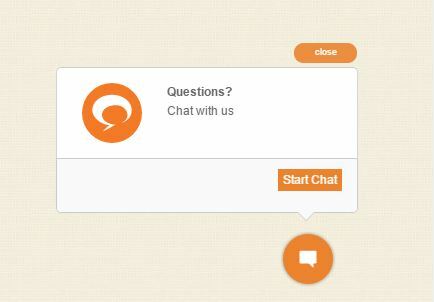 Fastening Solutions UK are delighted to announce that our website has now been updated to make it completely Tablet and Mobile Friendly allowing customers to access and read details easily while away from their Desk. FSUK are delighted to announce the launch of it’s new BN Nut to its portfolio of Self Clinch Fasteners. The FSUK BNUT range has been designed to allow a Blind Self Clinching Stand-off located on the inside of the panel to stop protrusion of Screws and foreign objects. Small bag sizes now available in multiples of 100. Following requests from our customers who only require smaller sizes of our product range we are now able to offer bag’s of 100 across our range. We can also offer other sizes which can be made to order and called off as required.